Operators: Didelev Yu., Dimich A., Sevastjyanov V., Gabdrahmanov E.
1. Mari ASSR. "The earth – the native land". The construction of the bridge. Building a bridge management Mariska-Todor". The head of Department Ivan Sergeevich Bashuk. 3. TASSR. 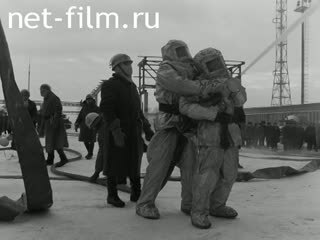 "70 years of Soviet fire protection." "Nizhnekamskneftekhim". 4. TASSR. "The decisions of the February (1988) Plenum of the Central Committee of the CPSU – in life." Pupils of high school № 123 in the classroom. The psychologist speaks with the student. 5. The Mordovian ASSR. Saranskoe Atelier "Fluff". A worker of the animal farm. 6. The Mordovian ASSR. "The memory of the poet". Meeting devoted to the 150 anniversary from the birthday of the poet Alexander Polezhayev. The monument to poet A. I. In lievo.